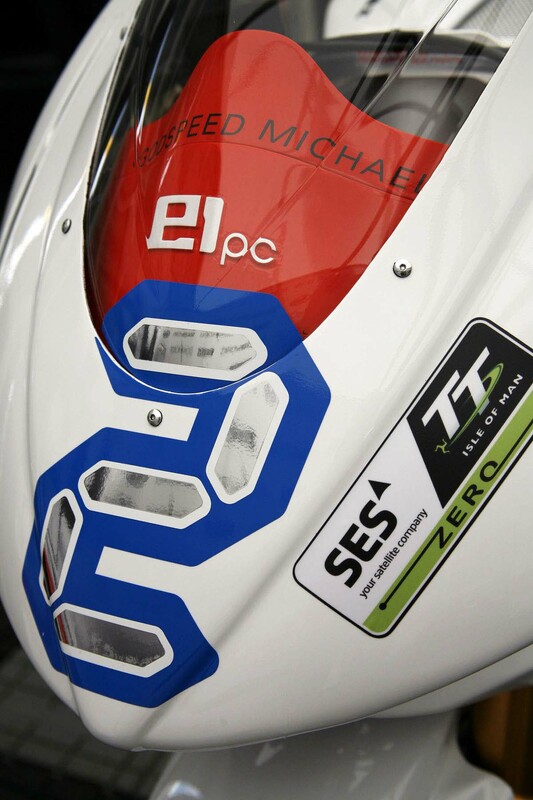 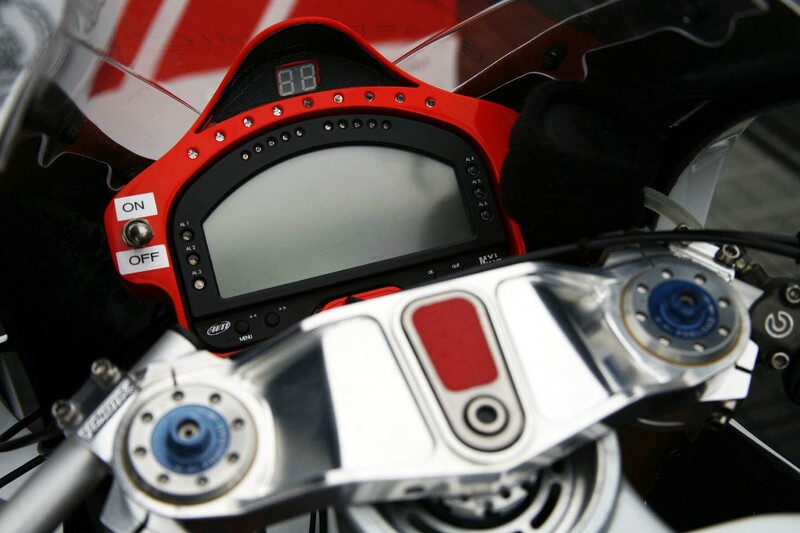 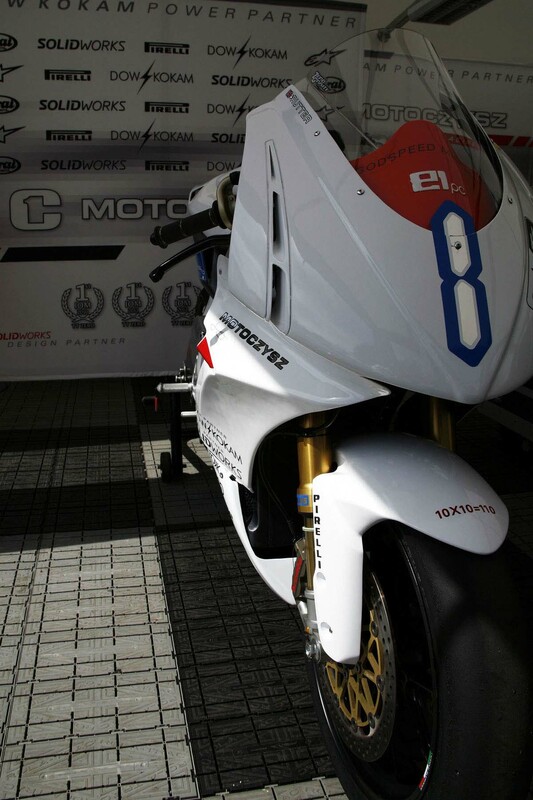 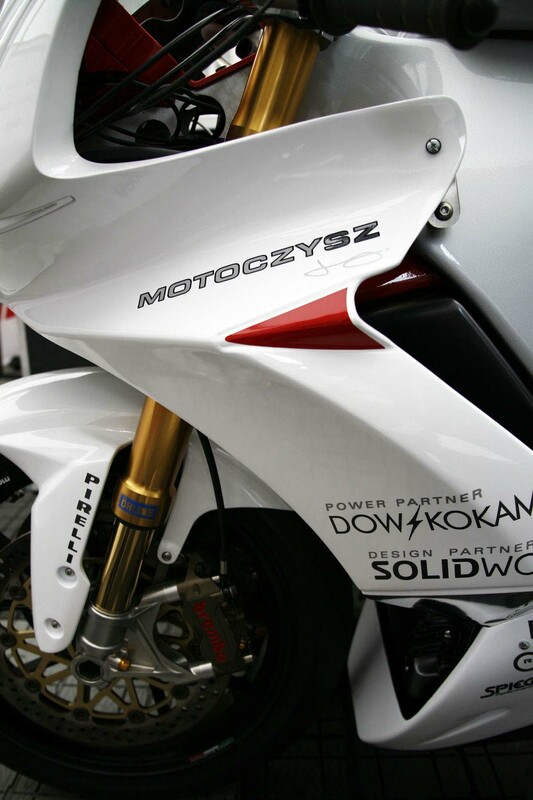 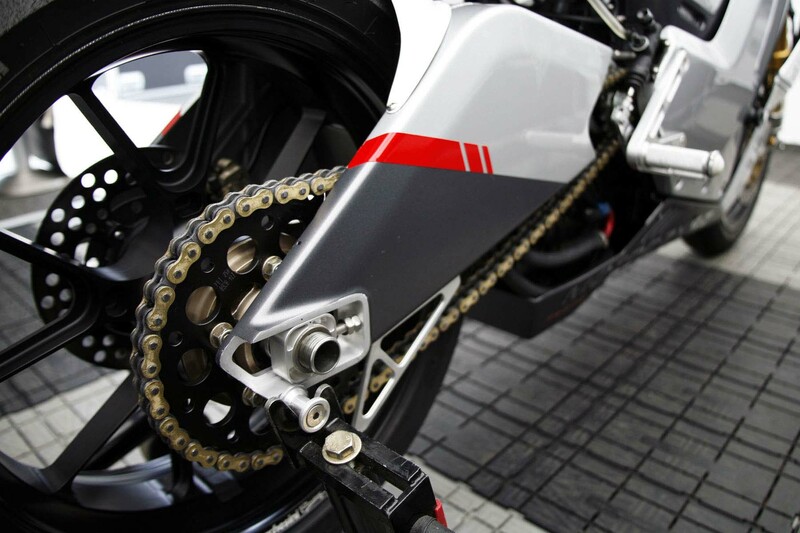 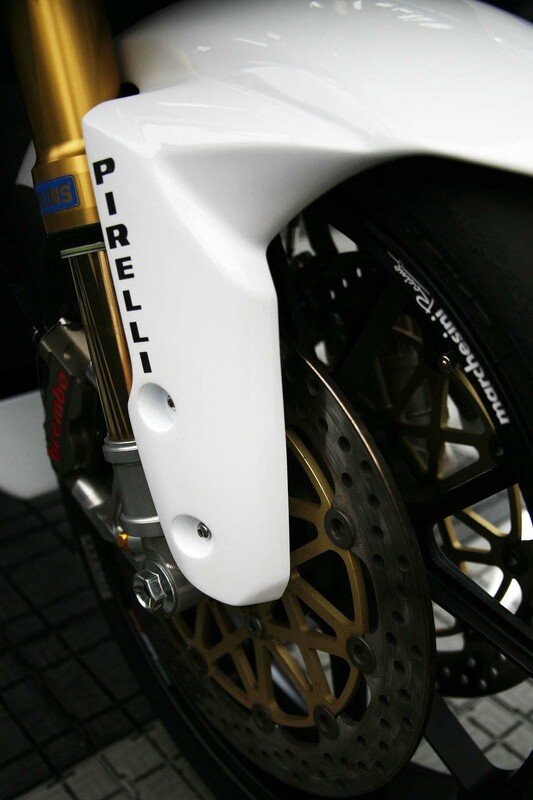 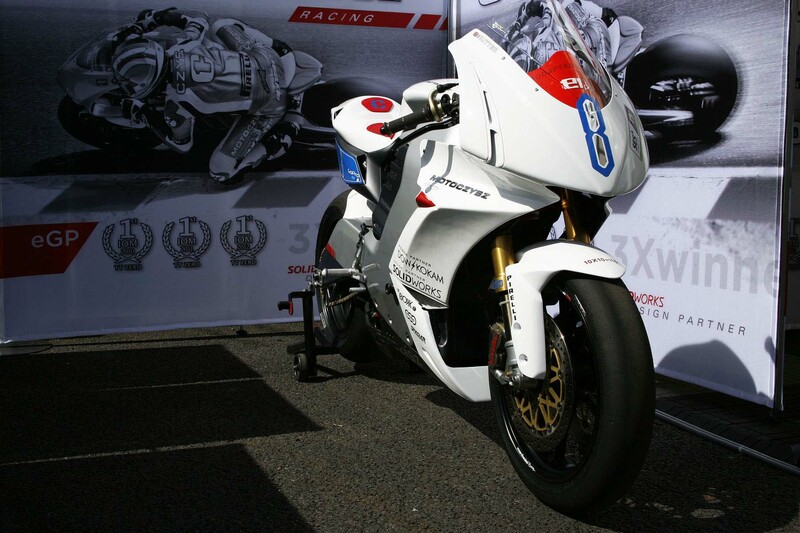 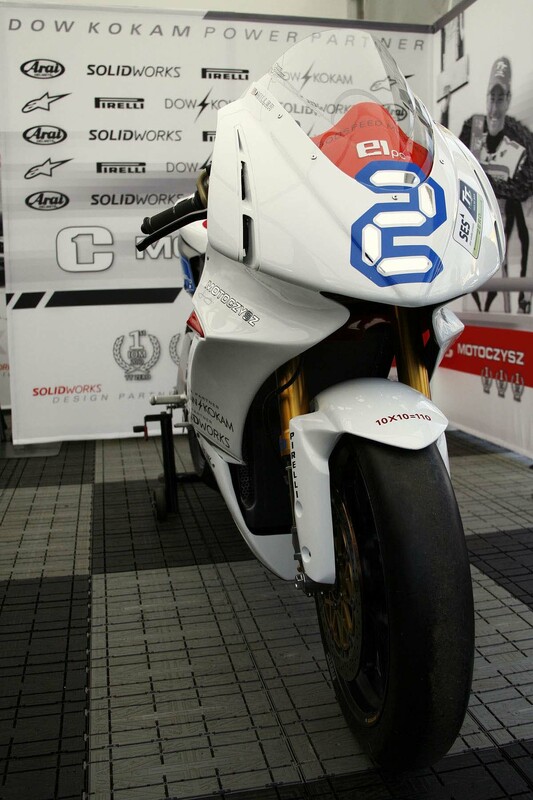 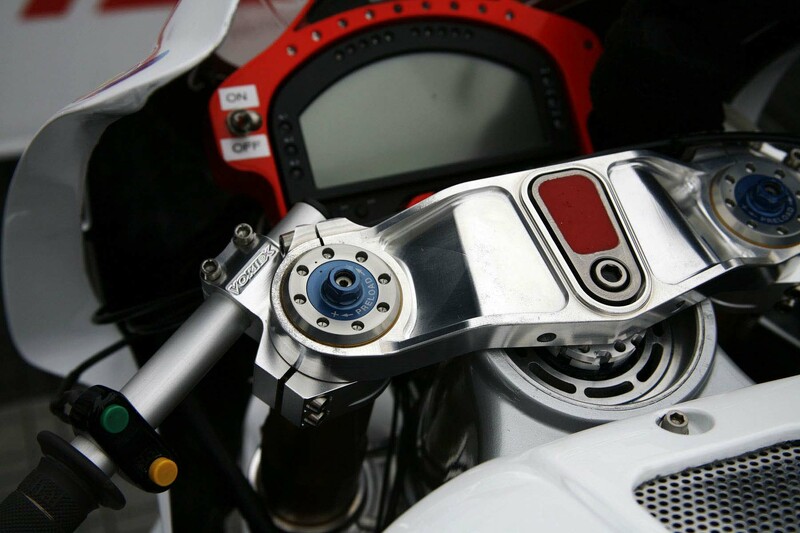 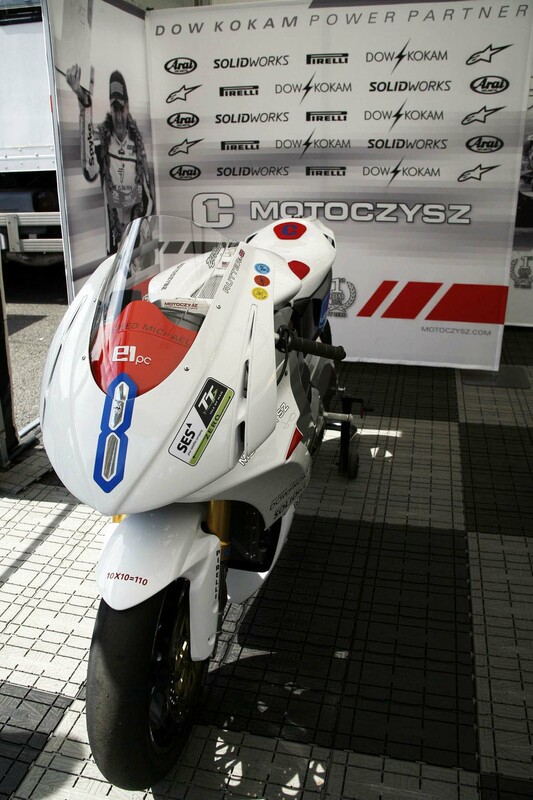 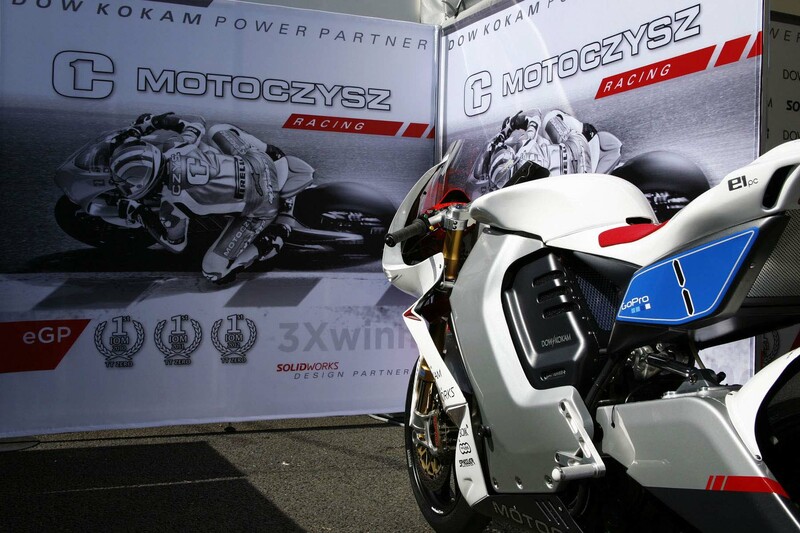 The most obvious changes made to the MotoCzysz E1pc for the 2013 TT Zero race are the use conventional suspension pieces. 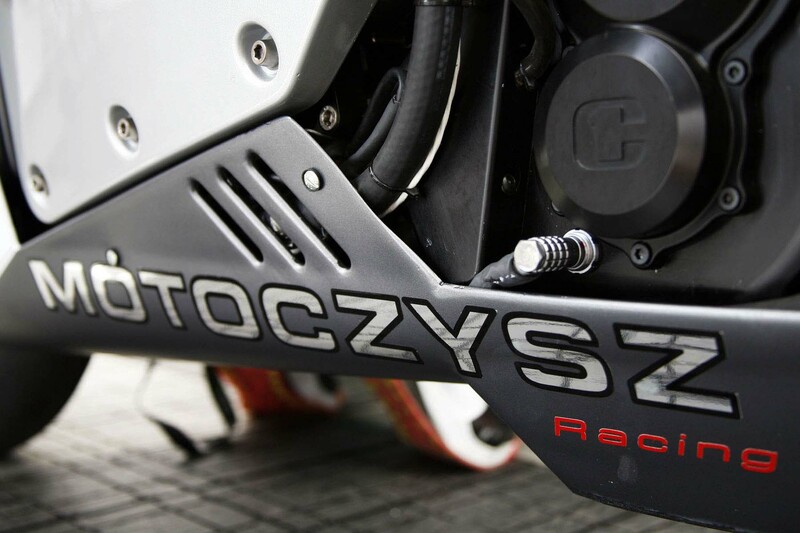 Gone are the elaborate linkages and under-tank shocks, with the MotoCzysz school of thought this year leaning towards keeping things simple, not to mention lighter. 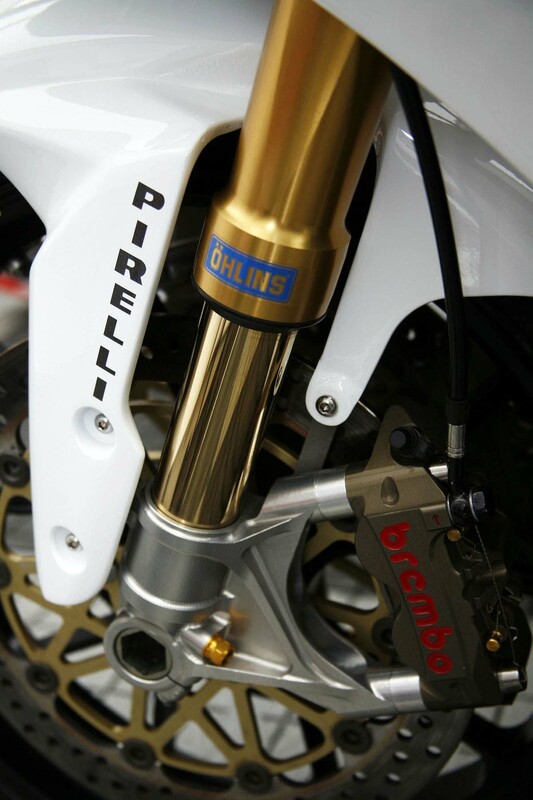 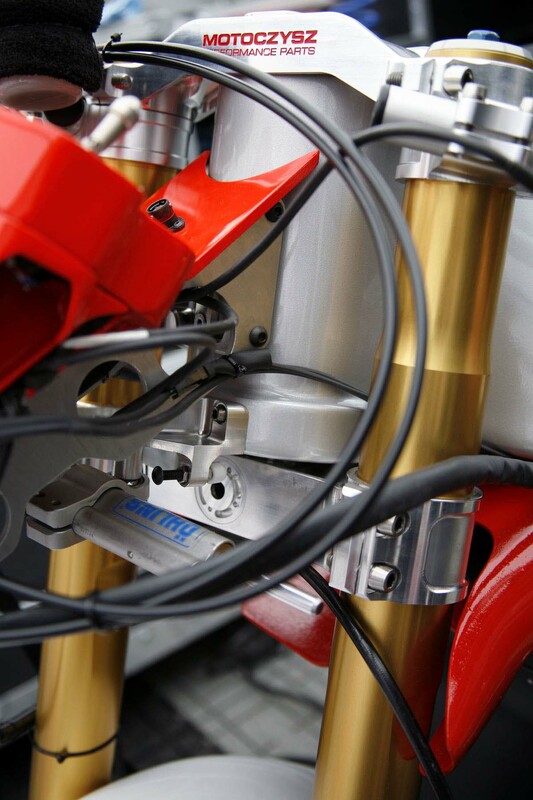 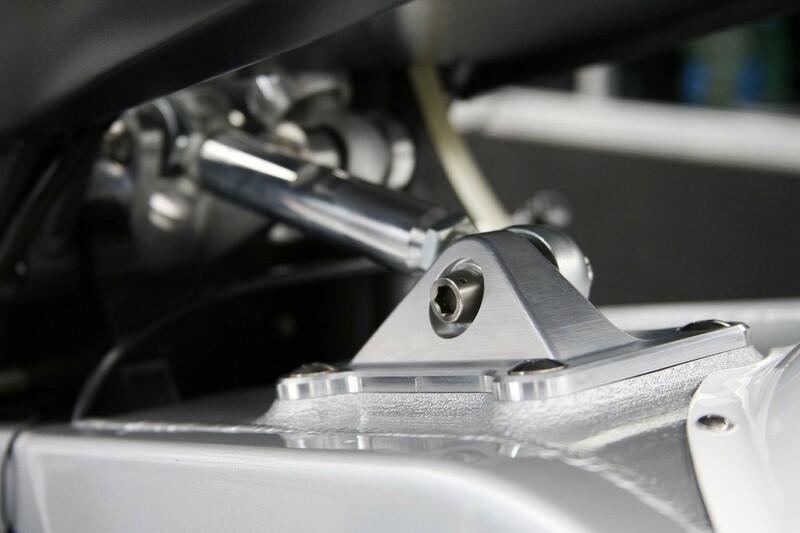 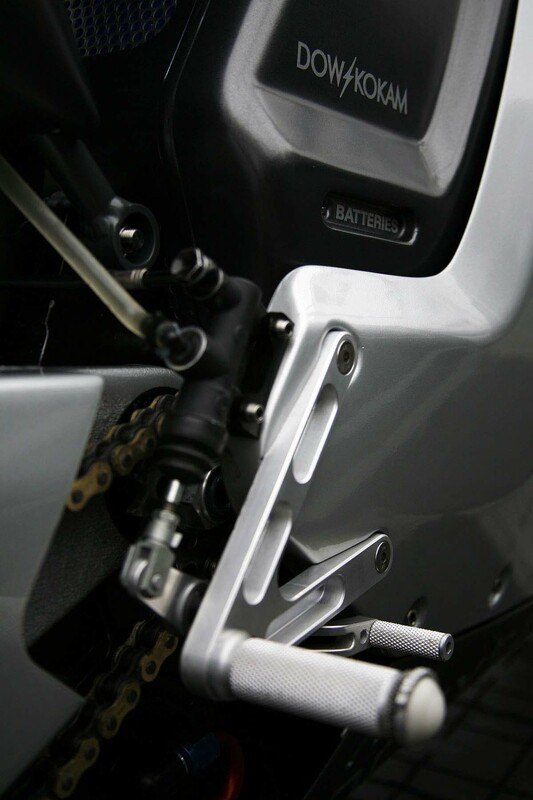 Of course, it’s not a completely standard suspension setup, as MotoCzysz has developed its own adjustable triple clamp that incorporates tunable lateral flex parameters, like on the previous oval fork slider designs from the company. 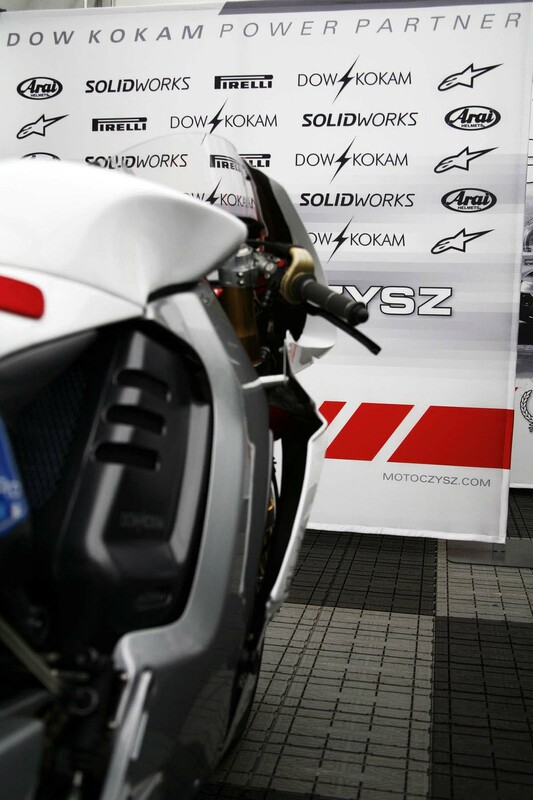 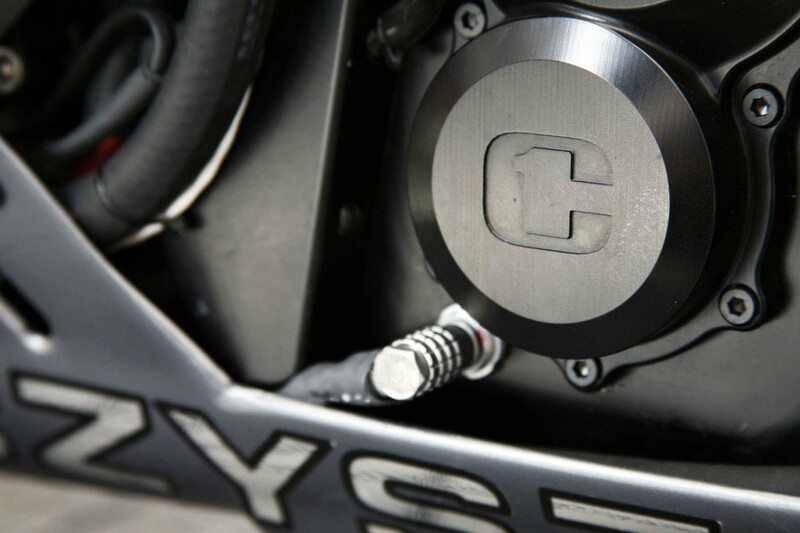 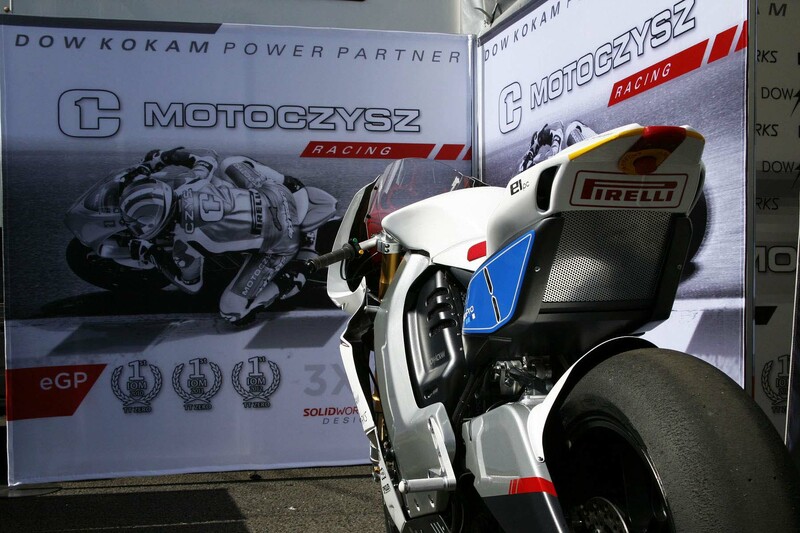 This new design is more scalable, Czysz explained to us, and also allows MotoCzysz to offer the advantages of its suspension technology to other machines (performance parts coming soon). 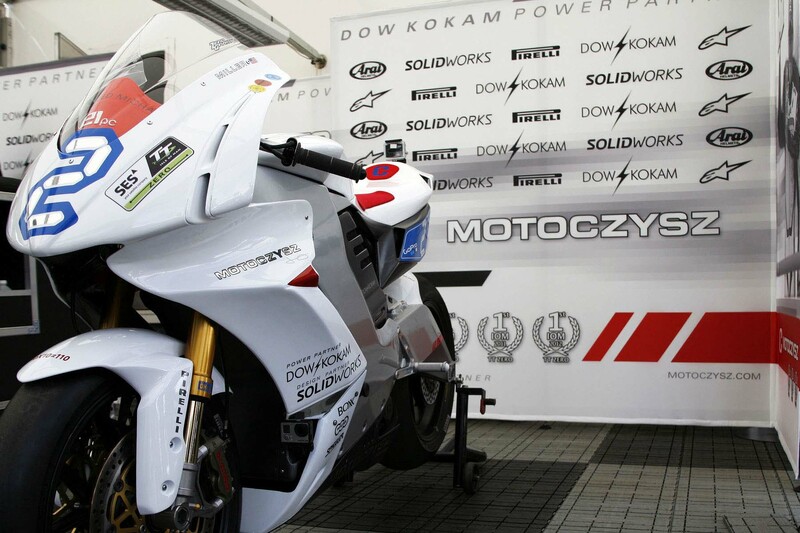 As you may have noticed, the radical aerodynamics are gone as well (you either loved or hated the winglets from last year), though you can see the lessons learned still remain. 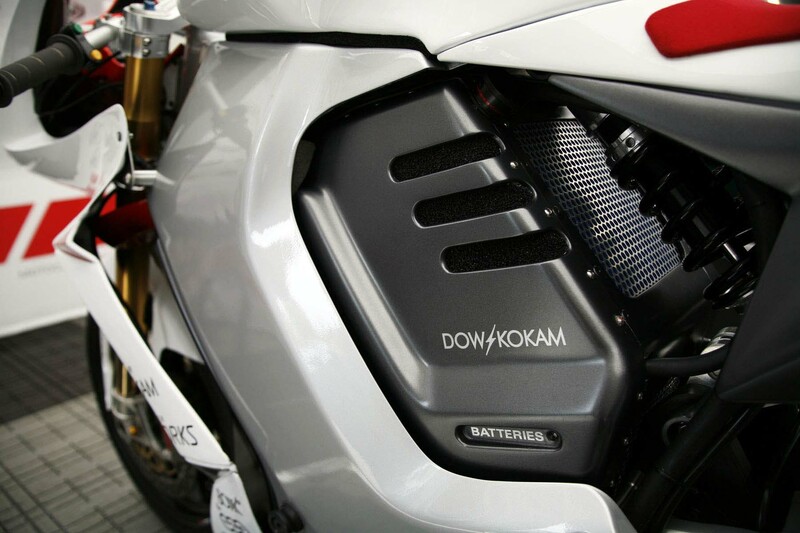 The front fairings, and the radiators they shroud, are like big scoops, pushing the air that has gone past the fork legs out from the center of the bike, to out and around the rider — except for a duct, which also pulls air from fore to aft, helping cool the electric drive components. 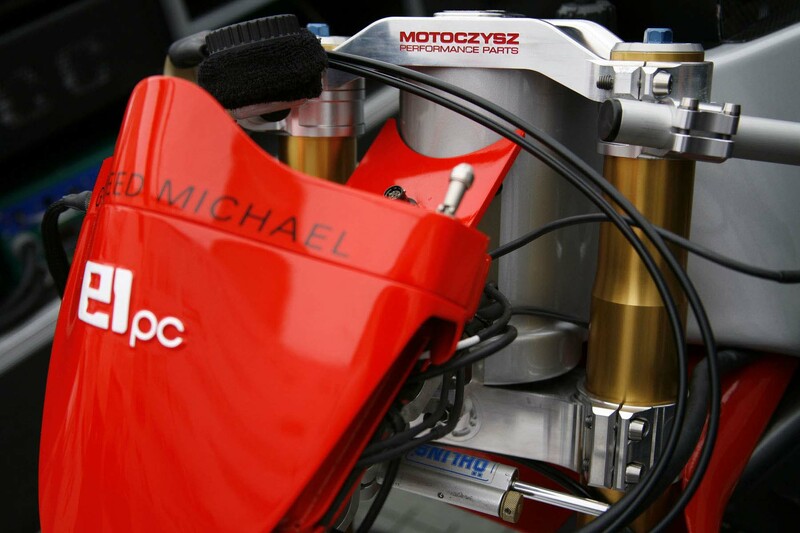 Using the same idea as the ’12 E1pc of sending high-pressure back to the low-pressure areas of the rear, Czysz explained to us that the ’13 E1pc uses half the length of sealed duct (in red, right below the triple clamp lower), and hopefully should provide less air resistance. 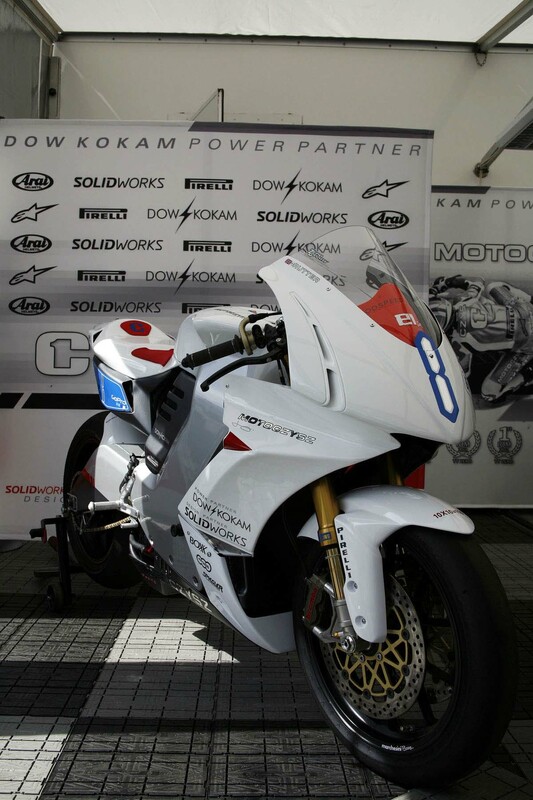 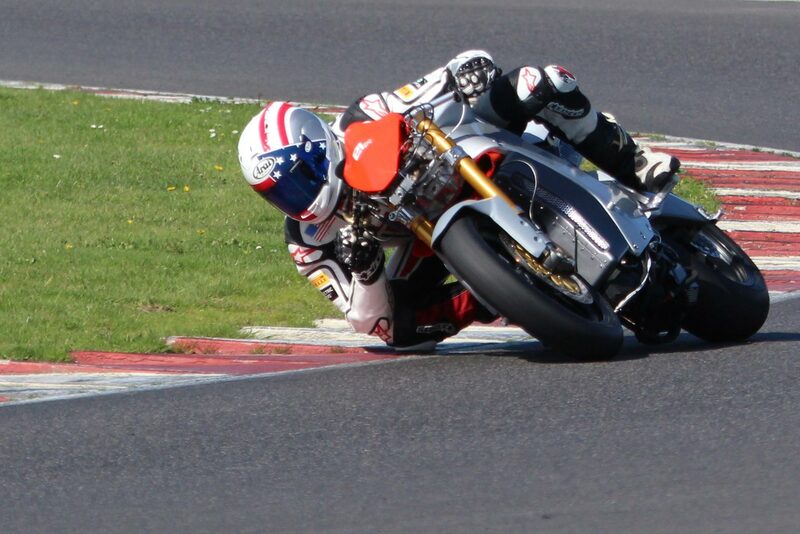 He even joked, “our motor/controller runs cooler than the beer they serve at the Isle of Man.” Hey-oh! 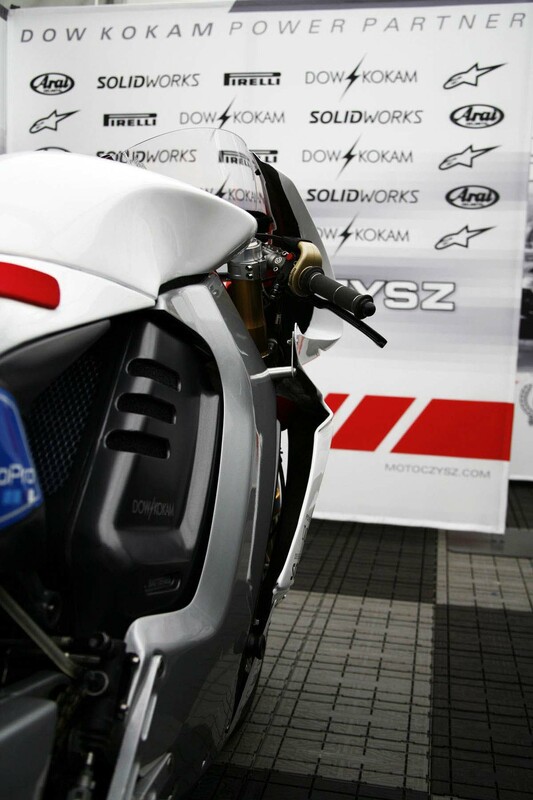 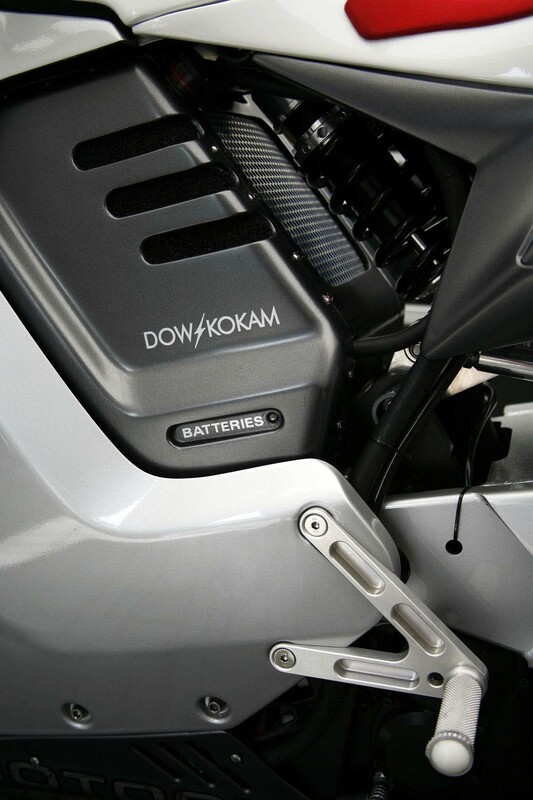 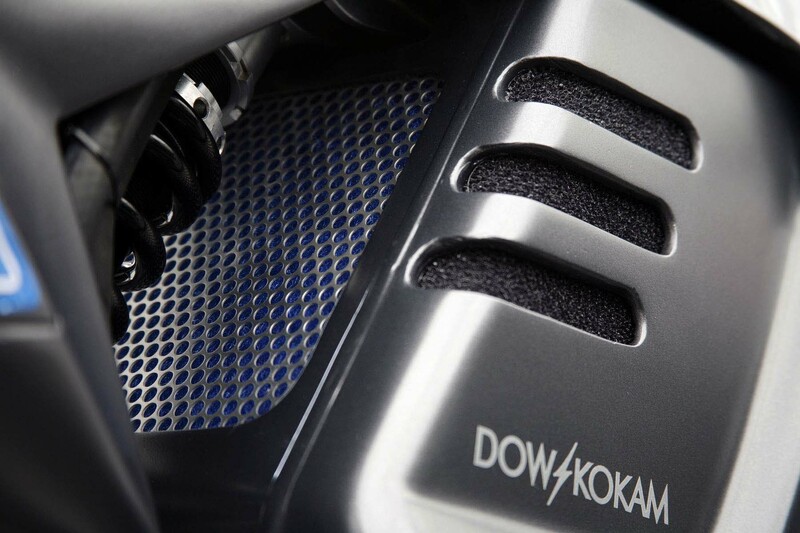 On the rear of the bike, the battery box under the seat provides a further streamlining effect, while boosting the on-board battery capacity (we saw MotoCzysz pull a similar trick in 2009). 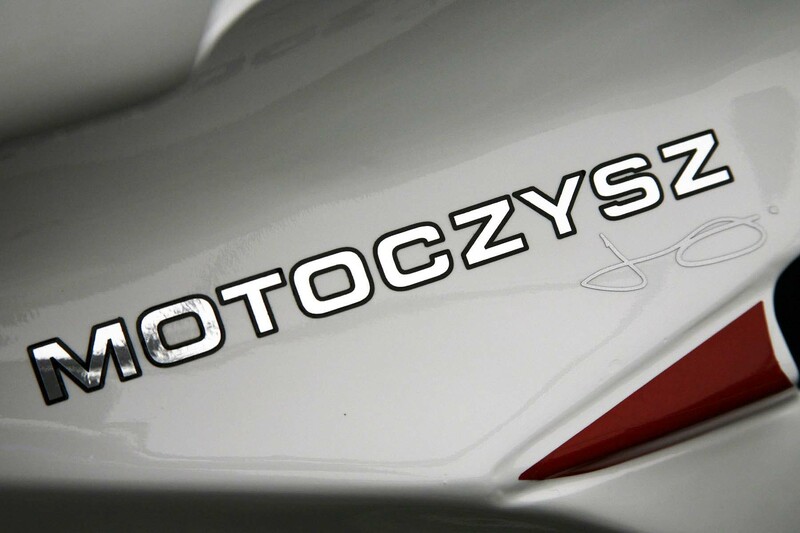 MotoCzysz is reporting a 20% increase in on-board energy, and this would seem to be the likely vector for that energy boost. 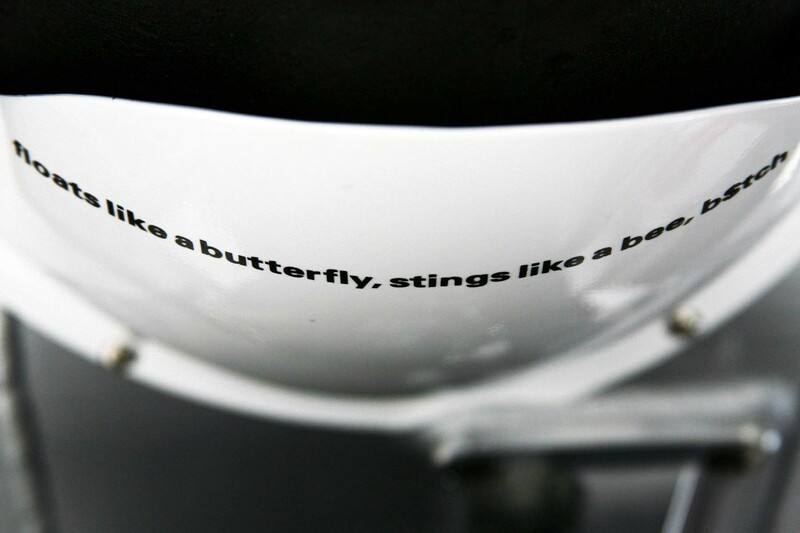 Looking at any of Michael Czysz’s designs, you have to stop and look for the details that abound. 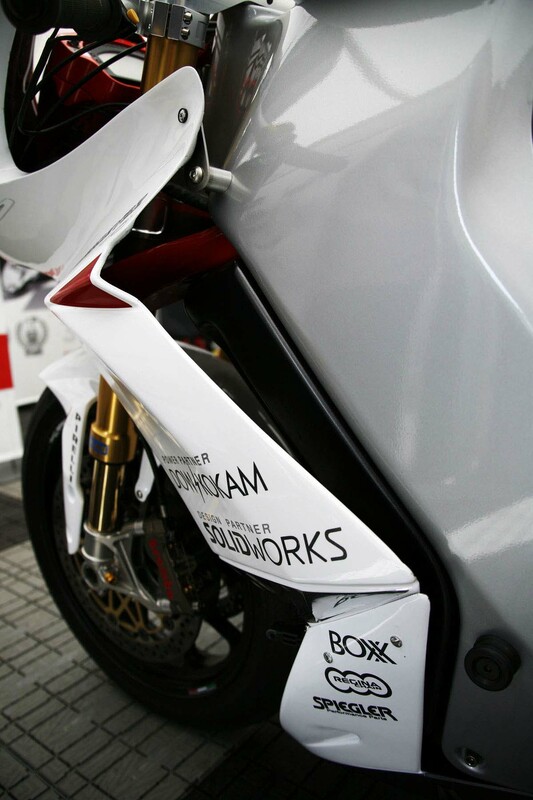 Normally, our attention would train in on the messages on the front fenders, which have always had a special meaning for the company. 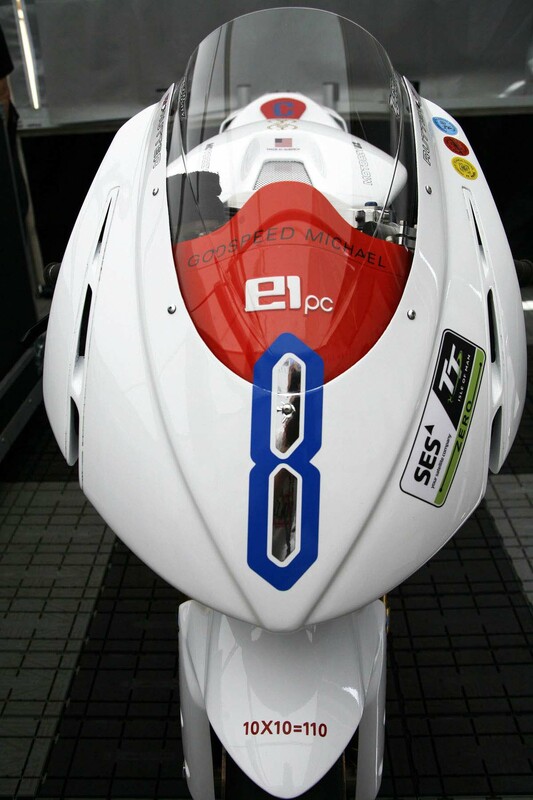 Last year the message was “< 22:38.28” on the fender, a nod to needing a lap time less than 22:38.28 in order to break the 100 mph lap barrier. 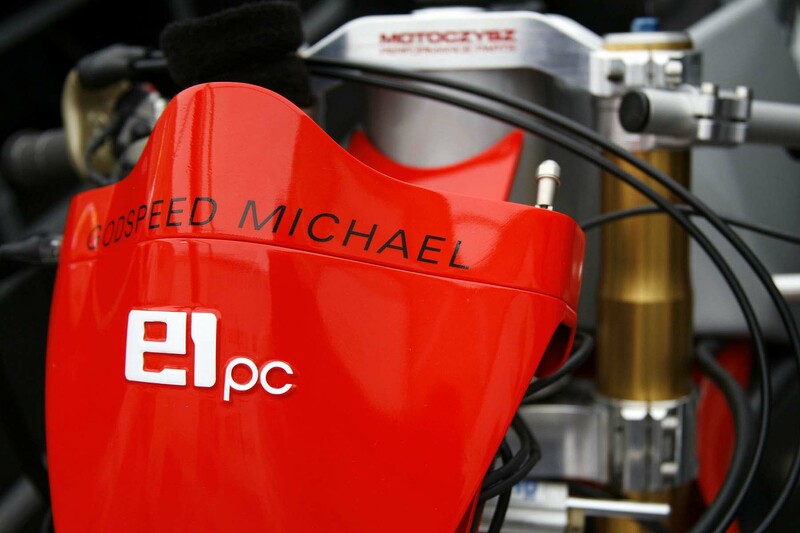 The team posted a 104.056 mph lap. 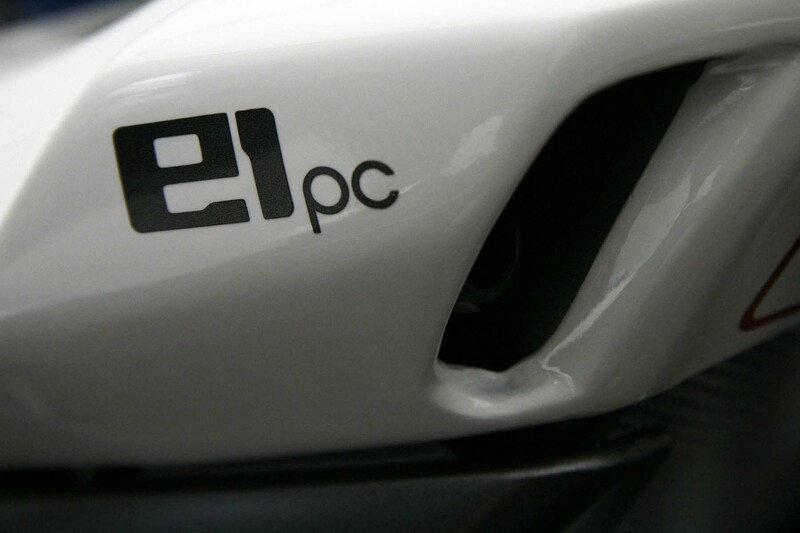 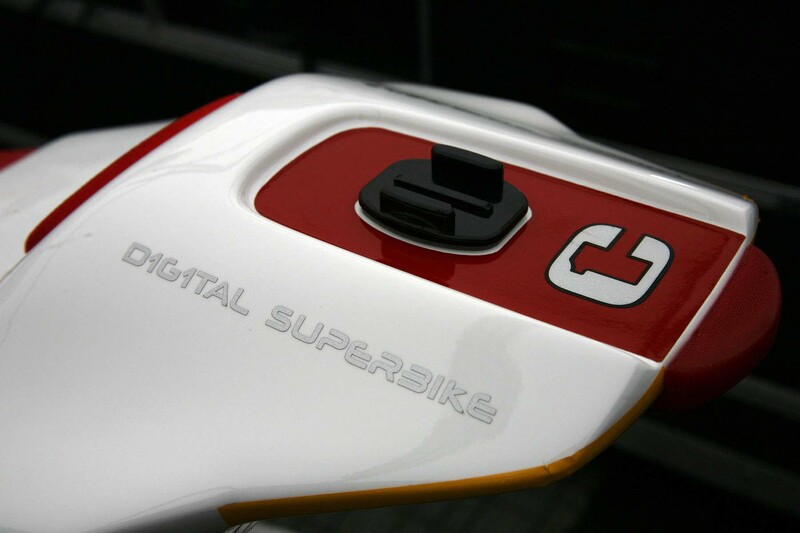 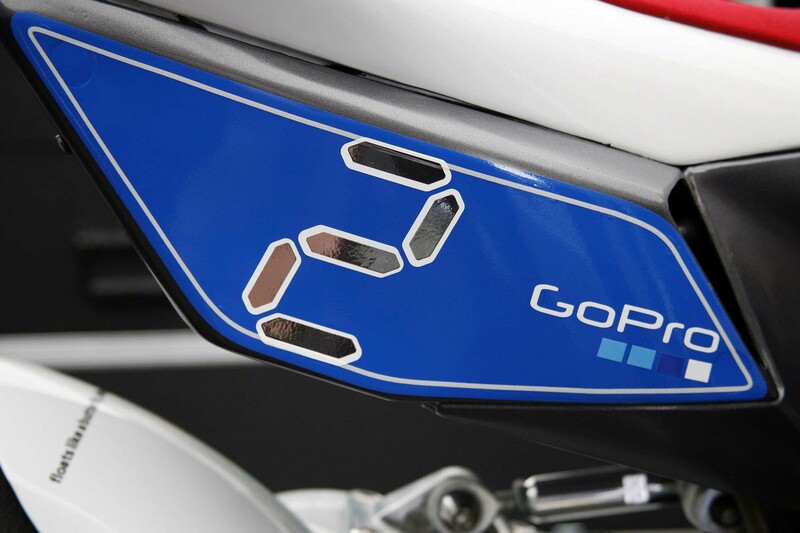 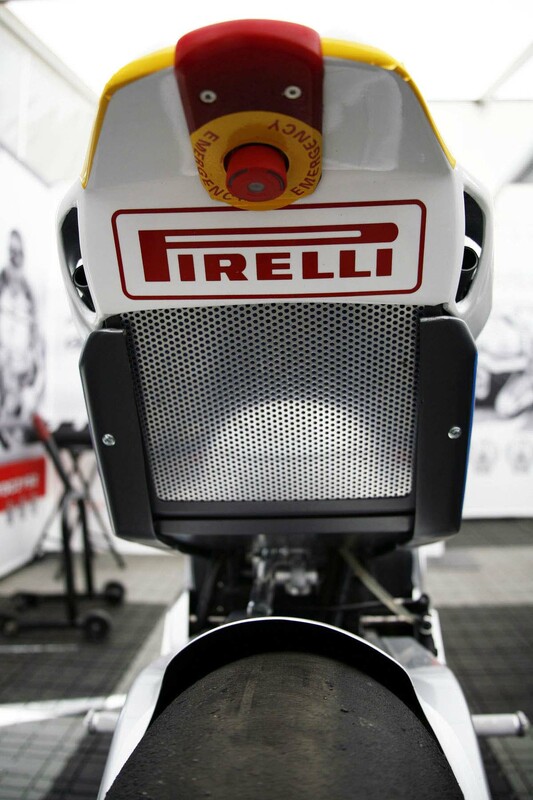 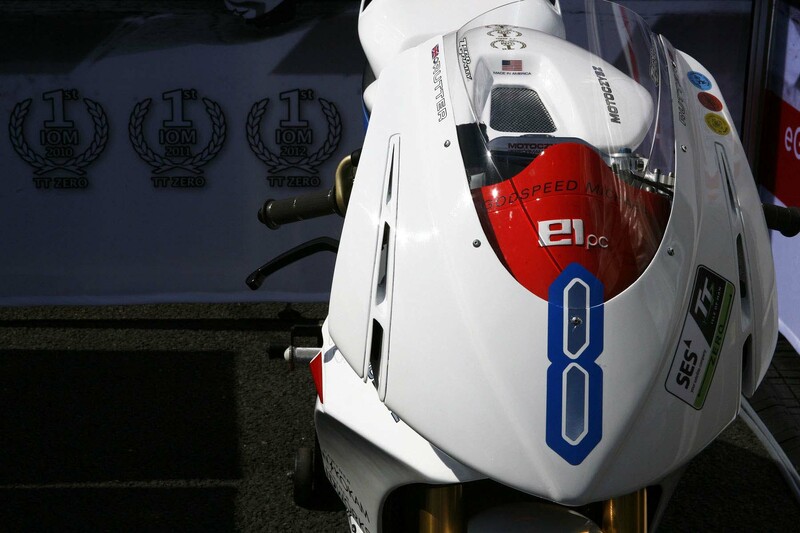 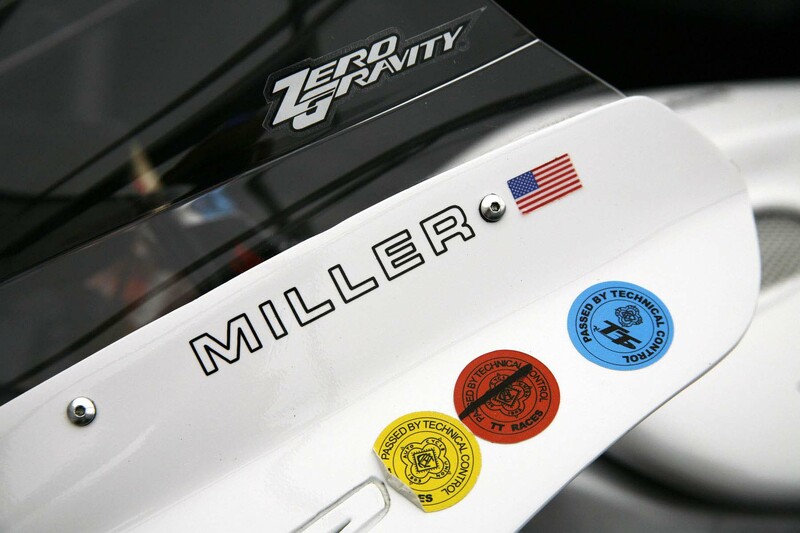 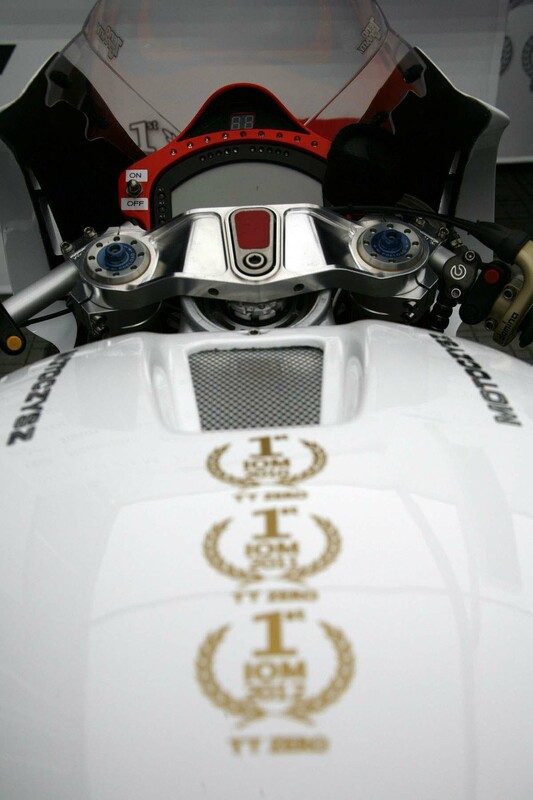 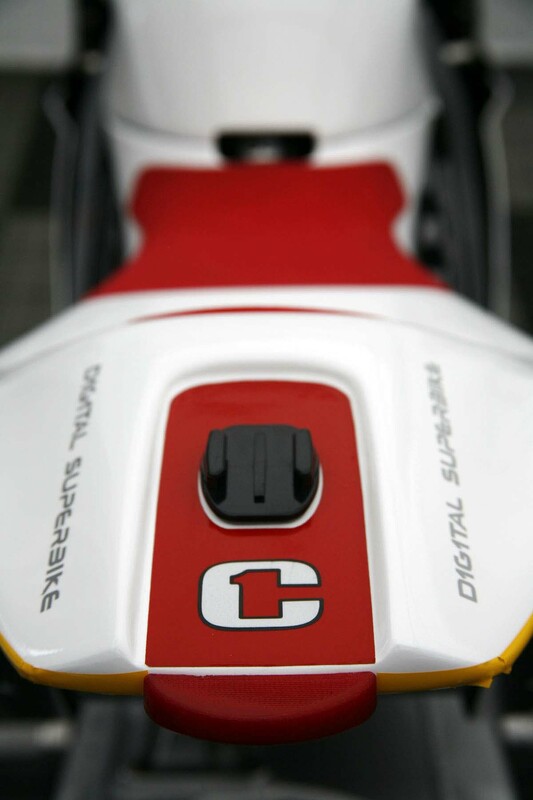 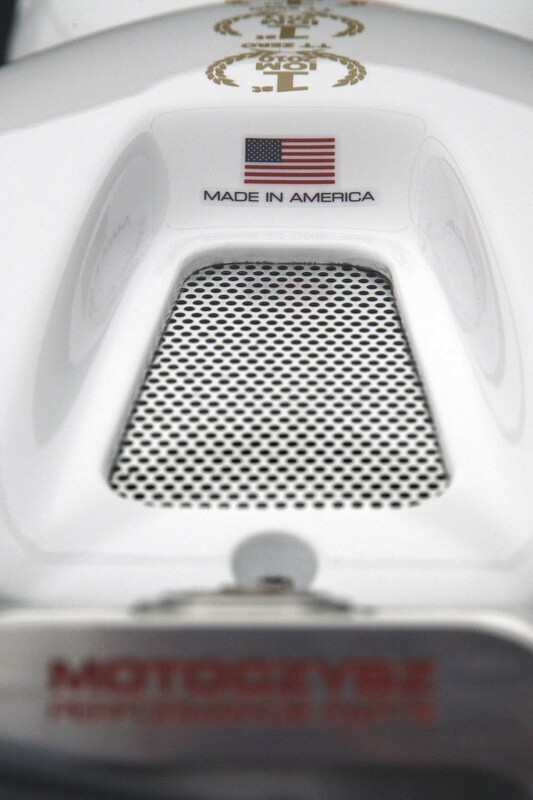 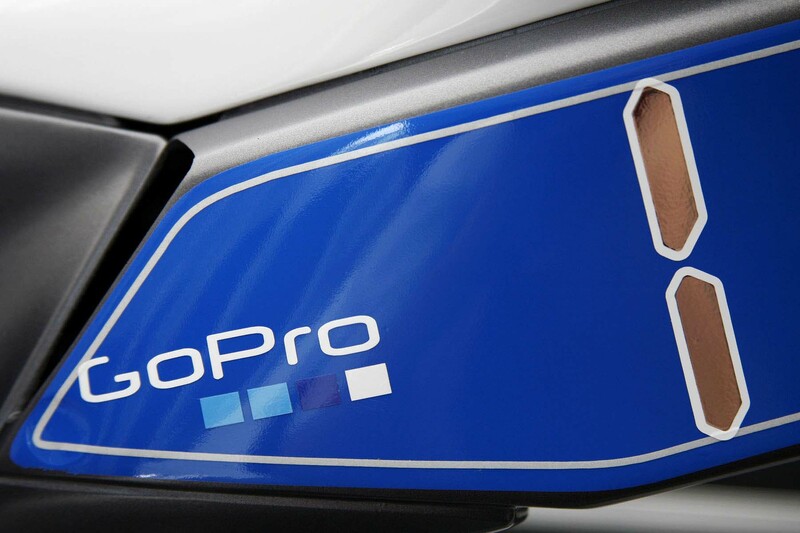 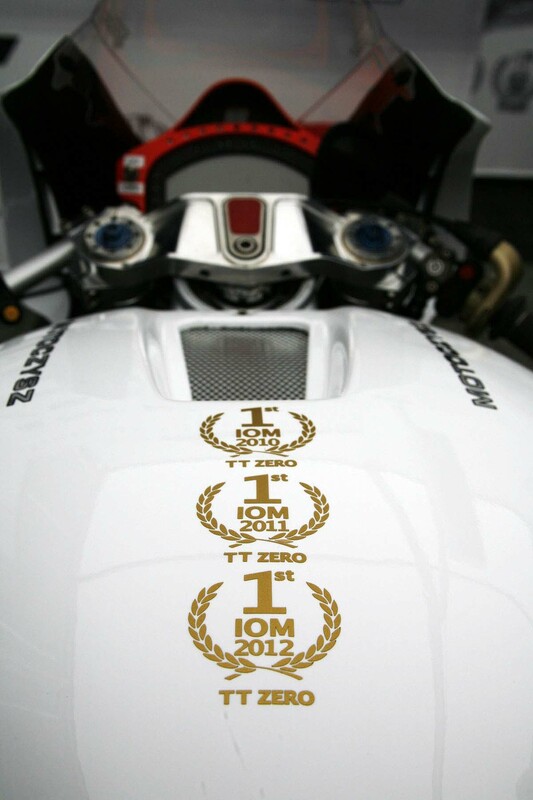 For 2013, the message on the front fender is a bit more cryptic, as “10×10=110” is inscribed on the ’13 machine. 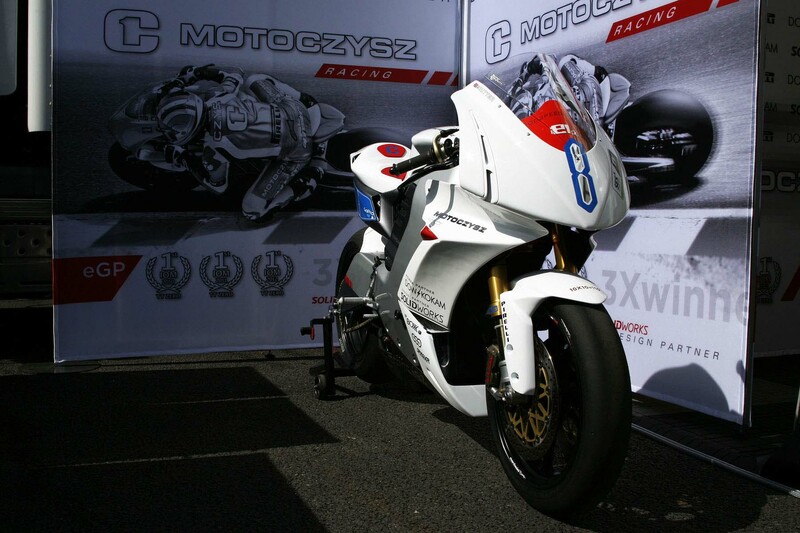 Asking Czysz about the meaning, he replied that it’s a nod to the 10 bikes that MotoCzysz has built in the past 10 years, and the ultimate result of that hard work being a 110 mph lap this year (fingers crossed). 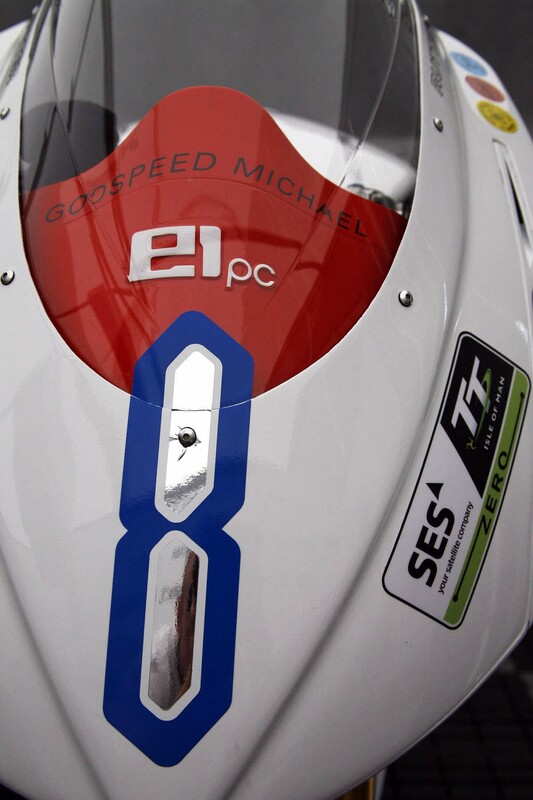 This year though, I think our favorite message is the one behind the windscreen, “Godspeed Michael” — we’re all pulling for you in your fight.